Boat Loaders V Boat Trailers - What's Right For You? Boat Loaders Vs Boat Trailers – What’s Right For You? Sick of leaving the tinny at home? Missing out on fishing opportunities? No more! You don’t have to sacrifice your boat for the sake of bringing the rest of your camping equipment or caravan on holidays. You can (and should!) take both. There are simple solutions available. Boat loaders or trailers can help, but consider these factors before deciding which is right for you! You are visualising getting out in nature and leaving no surface untouched. Pitching that tent, launching the boat and catching some fish for dinner are all on the to do list. Is there a more perfect weekend? It can very easily become reality with the right equipment! And so, the million dollar question – boat loader or boat trailer? Boat loaders are one of the easiest and most streamlined ways to transport your boat. But, like all tools, they pros and cons. Space saving – Being a type of roof rack, it means that you don’t require any further attachments on your car to move your boat from your home to your favourite local fishing spot. It is a huge space saver because you don’t have to bring anything extra with you, which is particularly handy when it comes to parking. Have it all – While many campers opt to transport their boat on their camper for reasons of wind resistance, those who don’t have a caravan will find a boat loader convenient. It also allows unrestricted access to more difficult spots that a trailer would not be able to reach. One person operated – If you enjoy solo fishing, you don’t have to worry because the 12v electric winch is controlled by using a handheld remote. You can operate it on your own. Lightweight – As it is constructed entirely of aluminium, it weighs only 30kg. This alone will save you money in fuel due to minimising excess weight being carried. Launching boat – Unfortunately the downfall to boat loaders is that you don’t launch the boat in the water like you would with a trailer. This means you have to manoeuvre the tinny from your car to the water. Loading and unloading – As it is transported on the roof, the outboard, anchor and fuel tank must be removed from the boat for travel. You will then have to reassemble it before using. A boat trailer has distinct benefits, too, but also comes with some extra rules and regulations. Easy launch – Unlike the boat loader, you can back the trailer right into the water and launch your boat. This also makes it easier to retrieve from the water when you are finished. There is no need to reassemble your tinny before you get it wet because you don’t need to remove anything for transportation. Disassemble – When you are parking up for the night or weekend, you need to account for time to fold up the trailer. Depending on your trailer, you might have a single fold or double fold which will also impact the amount of space you have. Lightweight – The complete aluminium boat trailer weighs a mere 38kg in total. This will not impact your fuel consumption greatly when on the move. Just watch for wind resistance though. Register for road use – You must register your trailer for on road usage. This means additional costs and it is speed rated to only 100km/hr, which means if you are on the freeway, you will slow down traffic. If you are looking for the best boat towing solution for your recreational needs, then consider all the factors above. They will help you make an informed decision on whether a boat loader or trailer is right for you! 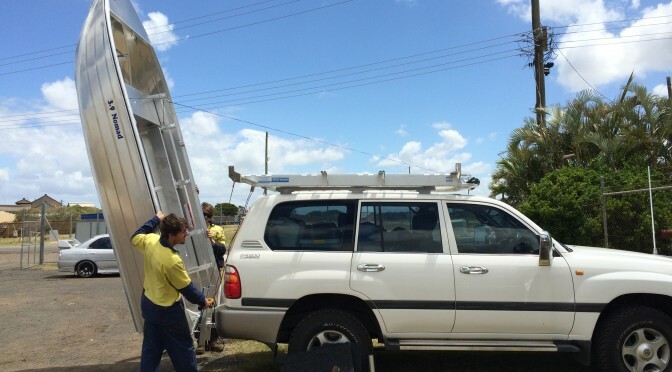 Get in touch with the professional team at Almac Trailers on (07) 4152 3737 and discuss your needs for boat loaders or trailers. Previous PostNEW Agent Gladstone QLDNext PostLooking for a boat trailer? Read this before you buy!